Holiday Park COE – Let's Go RVing! Since we had about 300 miles to drive today we wanted to get an early start – yeah, I know what is early for us? As soon as I got up I open the shades hoping I’d get a last look at some bison but nope, there were none around. We were able to put the car on the dolly at the campsite so that made leaving easier. As we pulled out I saw a group of bison at a water trough at a distance and then a lot of prairie dogs. I think they may be a real problem! Our drive was very uneventful and for once both the Garmin and the Clarion were on the same page. As we drove along we saw numerous clusters of wind mills and in all of that twirling we actually saw one not turning. Texas has more wind turbines than any other state with over 17,000. We could also see oil rigs pumping, a very different view from our North Carolina travels. We stopped for about 30 minutes while we gassed up both the car and the motor home. Yikes! Also we had our sandwiches in the parking lot. On to Benbrook where we are staying. We stopped at a Walmart on the way in so we wouldn’t have to leave again. It was the biggest and busiest Walmart we’ve ever been in but check out was quick. On to the campground, Holiday COE Park. It was easy to find and Clarion sent us straight there. When Jerry went to check in they told him to find a spot and then come back and tell them where we were and then they’d charge us. It is a very large park but initially neither Jerry nor I could understand the map they gave him. We aimed for site 38, never found it and eventually ended up at site 90 which is right on the edge of the lake. The site is 90 feet long! You could put two RV’s there. There are only three other Class A’s around us and I never saw any people except for cyclists and walkers, no one belonging to the coaches. Like other Corps of Engineer parks it’s located on a lake and offers electric and water and 50 amp at some sites, no septic though. When we checked in they gave us a map with the 50 amp sites marked. Since we won’t be using the AC we really could have stayed in a 30 amp. Using the America the Beautiful pass our charge for two nights was only $28. Pretty good! It felt so good to step outside and not be windblown and freezing. Although it’s only about 55 it feels like a heat wave. 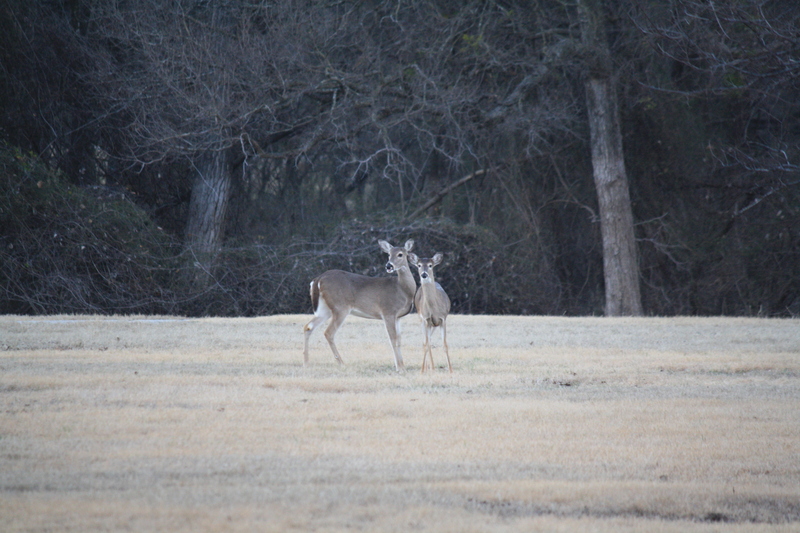 Jerry saw some deer at a distance so he went outside to photograph them. I walked with him for a while but it was just a bit chilly since I didn’t have a coat on so I went back inside. Like Caprock Canyons State Park, this campground is quiet and dark! Other than hearing a dog barking in the distance one time I never heard another sound. Jerry worked on getting the sleep number mattress level and we found out we were doing it backwards. We finally have a comfortable level mattress and it’s almost time to head home!